ARTICULAR FRACTURES OF DISTAL RADIUS: COMPARISON OF TREATMENT AND CLINICAL AND RADIOLOGICAL OUTCOMES WITH VOLAR PLATE VERSUS HOFFMANN BRIDGING EXTERNAL FIXATOR. 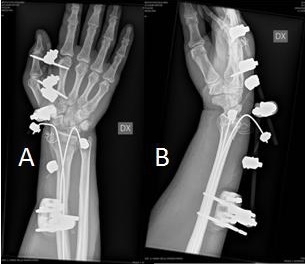 You are at:Home»Embj»ARTICULAR FRACTURES OF DISTAL RADIUS: COMPARISON OF TREATMENT AND CLINICAL AND RADIOLOGICAL OUTCOMES WITH VOLAR PLATE VERSUS HOFFMANN BRIDGING EXTERNAL FIXATOR. The Wrist fractures are one of the most frequent traumatic pathologies. Surgery is now more commonly recommended for this type of fracture as a means to improve the outcome of patients. The objective of this study is to compare treatment with volar plate vs. external fixation in these types of fractures. A total of 158 consecutive patients who had been operated on for distal radius fractures with or without ulnar involvement, were included in this study. 109 were treated with a volar plate and 49 with Hoffmann II external fixator. The exclusion criteria were patients with a history of wrist fractures, with neurological diseases, pathological fractures and polytrauma patients. Clinical and radiographic results were evaluated in both groups of patients. Clinical parameters were: average flexion, average extension, average pronation and supination, and the average radial and ulnar deviation. The radiographic parameters that we considered were the radial tilt and ulnar variance. In both groups, we evaluated the clinical results with the DASH score and the Mayo-Wrist score. The unstable and intra-articular fractures of the distal radius can be treated with different methods, among which the most commonly used are the open reduction and internal fixation with plates or the synthesis with external fixation. Our study shows how both methods provide similar clinical and radiographic results, so the choice of which to use depends more on the surgeon’s experience and the patient’s compliance rather than on the type of fracture.